Buddhism in India: Challenging Brahmanism and Caste is an exploration of the historical roots of Navayana, or New Buddhism, an Eastern Liberation Theology launched seemingly single-handedly by the father of modern India's constitution, Bhimrao Ramji Ambedkar. The first of India's untouchables to rise to not only national but international prominence, Ambedkar was a double PhD from Columbia and the London School of Economics. A tireless champion of civil liberties who began his political career as a labor activist, Ambedkar later came to stress the primacy of social, rather than economic, revolution. He believed untouchables would never claim their full rights until Hinduism, a system built on caste and the moral justification of oppression, was repudiated and replaced. It was precisely for this reason that Ambedkar tussled with Ghandi, who dismissed casteism as an unpleasant accretion that could be cut away while maintaining the romantic (and, according to Omvedt, historically suspect) idea of India as a Hindu nation. In Buddhism Ambedkar discovered the perfect vehicle for reformation, a home-grown religion in which individuals practice rather than believe, in which individual inquiry is held in higher regard than devotion to gurus or sacred texts, a religion based on ethics rather than metaphysics. After several years of careful study, he came to the conclusion that contemporary Buddhism had become cut off, distant, and unresponsive to the common man and was unsuited for the purpose of liberating the underclass. What was most needed was a new school of Buddhism, a Buddhism for the modern world, a socially engaged Buddhism that worked for enlightenment and nirvana for all people in this lifetime on this world. And so he composed a Buddhist catechism that rewrote some of the fundamental ideas of the religion as it has been passed down over 25 centuries. Scholars and clergy have questioned whether this is a real form of Buddhism, or something entirely different posing as Buddhism. 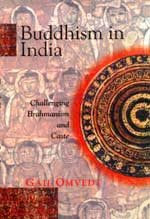 It is just this question that frames Gail Omvedt's study, a survey of the history of Indian Buddhism in search of antecedents of Ambekar's most controversial reinterpretations. These include shifting karma from the individual to society, setting nirvana as the earthly goal of stilling the passions, and reimagining the purpose of the monastic as a social worker rather than a self-absorbed recluse. Read the publisher's book description here.